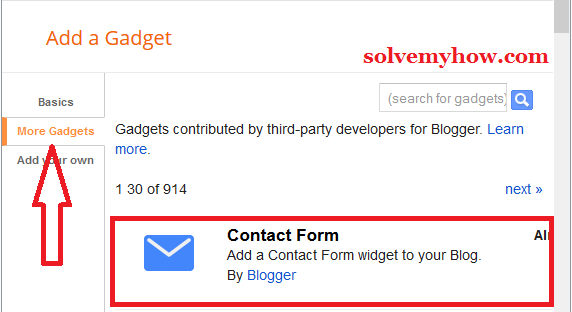 Blogger blogspot is getting SEO friendly day by day through its awesome updates and with the recent update, you can create contact forms easily just by adding a widget in blogger. We can also easily create custom contact forms just by adding CSS and HTML code in blogger template or page. Step 1 :- Go to blogger layout. Step 2 :- Click on "Add a Gadget". Now look for "add a gadget" option and you will find it in the right hand side and at the footer. Just select wherever you want to install contact form. PS. best place is footer (recommended). Step 3 :- Select contact form and click on "+" to add it. That's it. Just save all the arrangement once and open your blog. You will find a simple contact us form at the footer of your blog. Step 1 :- Hide the default blogger contact form. If you have added the default contact us widget then you have to hide it. Just to go Template >> Edit HTML. Then press CTRL + F and paste "]]></b:skin>". Now you need to paste the below mentioned code just above "]]></b:skin>". Step 2 :- Go to blogger >> pages. Now you need to add new page. Just click on "new page" and add it. Name it as "contact us" or "contact me" in the title of the page. Step 3 :- Change page setting "options". This block users to comment on contact us form. Step 4 :- Now switch to HTML mode. 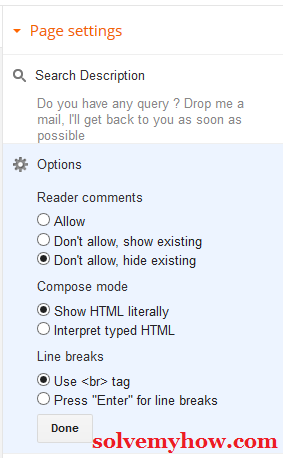 From compose mode switch to HTML mode and press CTRL + A and delete everything. 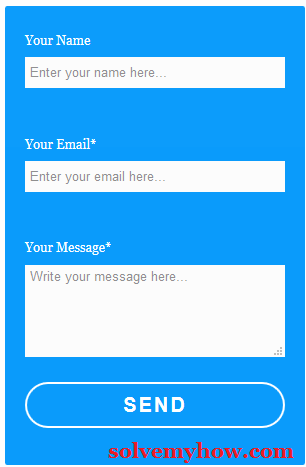 Step 5 :- Paste the "responsive contact us form code" mentioned below in HTML editor. Change green highlighted part and you can write your own message. You can also change "send" button styles by making some change in CSS part. Step 6 :- Publish the page. Just save once and click on publish. Now open your contact us page and send message/query to yourself to see whether it is working or not. That's it. So, this was the complete guide to create professional contact form in blogger blog. Hope you found this tutorial informative and helpful. If you have any question, you can ping me in the comments below. You can also subscribe for SolveMyHow newsletter to get blogger, SEO and make money online tips right into your inbox. Found this tutorial interesting ? Why not help us by shooting those social media button below, after all "sharing is caring" right !